Paul spends most of this chapter reaching out to the Gentiles. His mission that was given to him, by both God and the apostles in Jerusalem, was to minister to the Gentiles. Before Christ, the Gentiles were widely regarded as outsiders by the Jews. Their belief was set around their status as the “chosen people”. This led them to believing that the Gentiles would not be a part of whatever salvation the Messiah would bring. However, Jesus and Paul thought differently. The basis of salvation is not by who you were born to, but is rather based on faith. Paul writes, “to be specific, that the Gentiles are fellow heirs and fellow members of the body, and fellow partakers of the promise in Christ Jesus through the gospel” (3:6, NASB). This is Paul telling the Gentile and Jewish Christians, that the Gentiles are just as much a part of God’s Kingdom as the Jews. 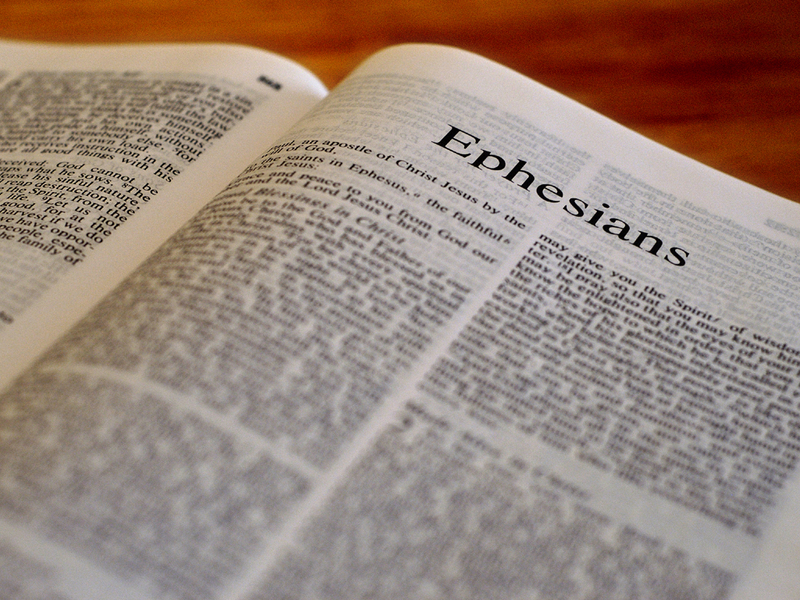 It would seem that the Ephesians church is having a problem that was very common during Paul’s ministry. This problem was that Jewish Christians would come in and tell the Gentile Christian that they were somehow of less significance or would have to conform to a Jewish lifestyle before they could be saved. We know this is wrong today, but it was something that many people believed then. Paul’s answer to this is the knowledge of God’s love. He tells them that he is praying for them; specifically he is praying that they learn about God’s love, “so that Christ may dwell in your hearts through faith; and that you, being rooted and grounded in love, may be able to comprehend with all the saints what is the breadth and length and height and depth, and to know the love of Christ which surpasses knowledge, that you may be filled up to all the fullness of God.” (3:17-19, NASB). The love of Christ is so all-consuming, that there would be no way for the Church to focus on things like Jews over Gentiles. Instead their focus would be to love each other, and spread the love to everyone else. This is a message that I believe still rings true for us today. We can get all caught up in living in a way that honors God that we forget why we do it. Yes, we should live a life that reflects Scripture. We should stand up for our faith, and oppose the things that God opposes. But I feel that there are people, especially some in the media and politics, that portray our faith as a list of rules that if we don’t make everyone follow they will all go to hell. Well I have news for those people; if they don’t believe in Christ, they’re going to hell anyway. No amount of forcing anything is going to help their salvation. As a matter of fact, it will more than likely push them away. Is that really the life that Christ showed us to live? Is that really living a Christian life? Christ said to the people, “Come to Me, all who are weary and heavy-laden, and I will give you rest. Take My yoke upon you and learn from Me, for I am gentle and humble in heart, and you will find rest for your souls. For My yoke is easy and My burden is light.” (Matthew 11:28, NASB). People can become weary when they are being told they are wrong all the time, or that their life should actually look like “this”. Jesus wants those people, and so should we. We should not be the cause of their stress. We should take them in and show them the love of Christ. We should take in the teenage mother, and tell her that Jesus loves her. We should hug the homosexual and tell them that God’s loves them. We should spend time with the felon, and share the love that God has given us. The point, I guess, is that God has given us so much love, we cannot contain it; we have to spread it. Love does not come from following rules, following rules comes from love. If we love God, we will follow the rules. But we cannot force people to follow the rules and say that it is love. Love comes from personal experience. We cannot lead people to that experience if we are constantly pushing them away. So, my brothers and sisters in Christ, let’s give “Bible-thumping” a rest. It isn’t helping our cause any. God is love, and we should be wanting to share that with everyone. Only God can “fix” people, so let’s trust Him to do that. We can just share Him with every single person we come into contact with. I know that we just came off of a super long Bible Study, which is mostly due to my lack of blogging. But it’s pretty much my policy that if God doesn’t give me something personal to share, than I turn the the Word. So we’ve selected a new passage of Scripture to start. But I found myself drawn to certain portion of this chapter, “In Him, you also, after listening to the message of truth, the gospel of your salvation — having also believed, you were sealed in Him with the Holy Spirit of promise, who is given as a pledge of our inheritance, with a view to the redemption of God’s own possession, to the praise of His glory.” (Ephesians 1:12-14, NASB). What I really noticed was the comment “you were sealed in Him with the Holy Spirit”. I feel like most people tend to forget about the Holy Spirit. Everyone speaks about the Father and the Son, but usually never mentions the third part of the Trinity. I have to admit, the Holy Spirit is a really complicated character. With the Father, we know that He is the one who created us and sits enthroned on high over all of Creation. The Son is also a pretty easy thing to grasp, He was the one that came to earth and sacrificed Himself so that you and me can have our salvation. But what about the Holy Spirit? Paul is saying in this section that the Holy Spirit is the God that marks us for salvation. Now He also does many other things (ie. spiritual gifts, power to the apostles, etc), but in this section Paul teaches us that God marks us with Himself by the Holy Spirit. The only way that we can receive that “mark” is by receiving God’s gift to us, the blood of Jesus. Paul says that the Holy Spirit is God’s pledge to keep the promises He made for salvation. We cannot count out the Holy Spirit. More people need to talk about Him as well. Without Him, there would be no salvation, no way to show honor to God, and there would certainly be no Church today. The Spirit is just as important as the rest of the Godhead. It is the work of the enemy to make you believe that any one part of God is less important then the others. The Holy Spirit was present in the beginning, along with Father and Son. We cannot separate the Holy Spirit for the rest of God. To do so, would be to allow the enemy to win a part of our hearts. How can we maintain the Spirit’s standing as a part of the Godhead? I would suggest, by way of Francis Chan, that we no longer call Him “it”. “It” implies that He is something different and unknown. But God has chosen to reveal Himself as triune and with the male gender. So from now on when we refer to the Holy Spirit, no longer is He “it”. He shall always be “He”. Then we must learn to understand Him better. Ask your pastor, ask a Biblical scholar you trust, and (most importantly) ask God. Pray and ask God to show Him where His Spirit is present in your life and how to better understand Him. When we forget about a part of God, we choose not to glorify God in the way that He has revealed Himself. Instead, we form our own idols of who think God is. Remember, God is Father, Son, and Spirit. Sorry it’s been so long and unpredictable when I’m going to blog. I’ve been going through a pretty rough time in my life. Today I finally feel renewed and feel that it’s time for me to get back into this blog. So hold on tight. 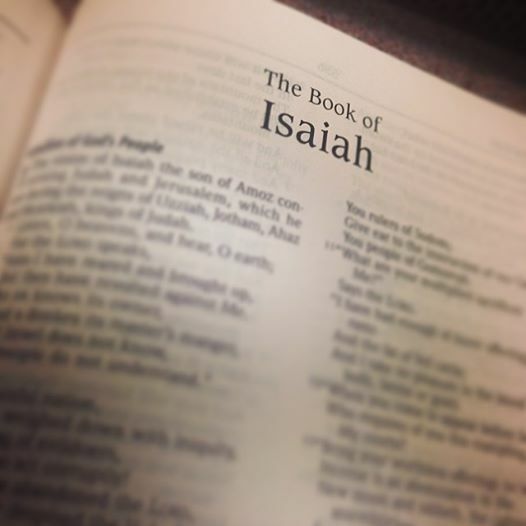 We are going to finish the Book of Isaiah today! Who knows what tomorrow will bring, but if we’re all here there will be another post! As we finish the book of Isaiah, we start with a depiction of God coming in wrath among the nations of the world. He is covered in a red garment. He is asked why, and God explains that it is the blood of those who do not follow Him. Calling forward to the future crucifixion, God is pictured in blood, suffering in order to save His people, and dying for people of all nations. “In all their affliction He was afflicted, and the angel of His presence saved them; In His love and in His mercy He redeemed them, …” (63:9, NASB). In verse 16 we see a glimpse at the future struggle of Gentile Christians. “For You are our Father, though Abraham does not know us and Israel does not recognize us. You, O Lord, are our Father, Our Redeemer from of old is Your name.” (63:16, NASB). God’s people, Jews and Gentiles, offer up a prayer of mercy and help. They recognize that God is angry because of their sin. They have all chosen to go against God. Now, they have realized the error in their ways, and are asking Him to give them mercy. “You meet him who rejoices in doing righteousness, who remembers You in Your ways. Behold, You were angry, for we sinned, we continued in them a log time; and shall we be saved? (64:5, NASB). They now submit themselves for God to make them as He thinks is right “we are the clay, and You our potter;” (64:8, NASB). They recognize that they need His mercy in order to become the people that He wants them to be. Their heart’s cry is to simply be made new. For God to destroy their old selves, and make them new. The nation of Israel had long been a people who knew about God. God calls the a rebellious people. They constantly turn away from Him, and do the things He has asked them not to. So God tells His people that He has chosen a new people that will obey Him. He says, “I permitted Myself to be sought by those who did not ask for Me; I permitted Myself to be found by those who did not seek Me. I said ‘Here am I, here am I,’ to a nation which did not call on My name. I will bring forth offspring from Jacob, and an heir of My mountains from Judah; even My chosen ones shall inherit it, and my servants will dwell there.” (65:1 & 9, NASB). “Behold, My servants will eat, but you will be hungry. Behold, My servants will drink, but you will be thirsty…” (65:13, NSAB). God is telling the people of Israel that because they are unfaithful, He will take care of those who obey Him before them. They will find themselves in need, and God won’t help them until they seek Him. Then God promises a new creation. He will remake Jerusalem, and the earth, into a place that knows and follows God through the people who obey Him today. God does make one final warning to His people before the new Creation. It is not simply good enough to say and do the correct things. They have to actually do them and follow God, because they know it is right in their hearts. Hypocrisy has no place in God’s new Creation. God’s new Creation will see an end to all evil, and people who actively work against Him. “Then they will go forth and look on the corpses of the men who have transgressed against Me. For their worm will not die and their fire will not be quenched; and they will be an abhorrence to all mankind” (66:24, NASB). We live in some crazy times. We hear people all the time denouncing God. There are Muslim extremist groups who’s sole purpose is to destroy either the US or Israel. This something easy for us to remember as our nation remembers the events of 13 years ago today. We see and hear about despicable acts towards women and children, simply because its a lucrative business and makes someone lots of money. We live in a world full of evil, but there is hope. We have hope because of Christ. We find our salvation in him, so our souls are good. But what about this world that we all must live in until it is time for us to go home? God promises a new creation for the people who follow Him. All evil will be eradicated from this world, and God will set a new world with Himself and Christ at the center. If you’d like to read more about that I’d suggest reading the event in the Book of Revelation. For us today though, as we live our day in/day out lives, God’s promise is still there for us. God will never leave or forsake you, so long as you believe in His Son. Jesus is the way that we can have hope in a world full of evil. Christ came, and died for our sins so that we can have God’s promises. We just have to make a stand and follow Christ, no matter what the world tells us. I’ll end here with a verse that has been my prayer today, and I hope it becomes yours. With the desolation of Jerusalem, the city was now longer a symbol of glory for the people of Israel. However, God wants to see it restored. He shares a vision with Isaiah showing that not only is Jerusalem restored, but people from all nations come to worship God. First the people of Israel will be brought back to their home land, after the Exile. With their help, “Foreigners will come to rebuild your towns, and their kings will serve you.” (60:10, NLT). All nations are bound to serve the people of Israel; they will be glorified above all others because of God and they will praise God. “salvation will surround you like city walls, and praise will be on the lips of all who enter.” (60:18, NLT). God isn’t done with His people. He knows them, and remembers His promises made to them. Blessing will come upon them because of their oppression . “Instead of shame and dishonor, you will enjoy a double share of honor. You will possess a double portion of prosperity in your land, and everlasting joy will be yours.” (61:7, NLT). The people have had to suffer because of their sin. But now that the punishment is over, they will enjoy great blessing from God. When Jerusalem is restored, the people of Israel shall be restored as well. They will become something desirable, a shining light to all the nations. Where they were once thought of as a nation of undesirables, all people will come to see there glory and God’s glory. “They will be called ‘the Holy People’ and ‘The People Redeemed by the Lord’. And Jerusalem will be known as ‘The Desirable Place’ and ‘The City No Longer Forsaken’.” (62:12, NLT). In this reading I realized something about myself, I take my salvation for granted. The truth is that salvation does for us the same thing God is describing in these passages from Isaiah. We were all once disgraceful because of our sin. There was no need for anyone (even God) to give me a second thought. Yet still, he did think about me. He thought about me while hanging on a cross. And because of that, I now have glory in God. I had always known what happened, and just took for “I’m a Christian and that what God does for me.” The honest truth is that God does this for everyone. Not just me and other Christians, but even people who don’t believe in a Him. But the thing that really gets me (God has been working on this in me recently), is that he does this for his enemies and people who actively work against Him. The people who fight against God can still be saved by His redeeming grace if they simply put their faith in Him. God is calling us back to a place of glory. He wants to bestow great blessings upon us and make us a shining light for all people. But he can’t do this until we choose to come back to Him. The people of Israel were taken away from their homes for 40 years in order to teach them this lesson. God teaches us this same lesson today. When we fall away from Him, life gets much more difficult and dark. But when we come back, He pours out the blessings! So if this is you today, I pray that you recognize what is going on and make the changes you need in order to come back to Him. He desires to be close to you. So come back to Him. After His call for Israel to put their trust in God, He moves to promise their salvation. The Israelite nation has been taken into exile, and now is held in “enemy” territory. God recounts the days that Israel was in slavery to Egypt. “Long ago my people chose to live in Egypt. Now they are oppressed by Assyria. What is this? Why are my people enslaved again?” (52:4-5, NLT). In the land they were being kept, God’s name was constantly being blasphemed and ridiculed. It would have been enough to cause the Israelites to question if their God was even real. But He responds to them, “But I will reveal my name to my people and they will come to know its power. Than at last they will recognize that I am the one who speaks to them.” (52:6, NLT). God offers them a vision of a restored Jerusalem, where there is much celebration at the people’s return. They will be allowed to leave their places of captivity and travel back to their land. Bu they will not do this alone. God promises to go with them, “For the Lord will go before you, and they God of Israel will be your rear guard.” (52:12, NASB). God then switches focus away from the people of Israel towards God’s servant, better known to us as Messiah. God begins to talk of an exalted servant, who has been “marred” (52:14, NASB) or “disfigured” (NLT). This servant will bring untold knowledge even to the kings of other nations. Isaiah opens up to a vision that we know today as the Passion story found in all 4 of the gospels. He describes all the events that Jesus was put through at the end of his life (keep in mind this was written 500-600 years before he was born). “But He was pierced through for our transgressions, He was crushed for our iniquities; The chastening of our well-being fell upon Him, and by His scourging we are healed … He was oppressed and He was afflicted, yet He did not open His mouth; … His grave was assigned with wicked me, Yet he was with a rich man in His death, because He had done no violence, nor was there any deceit in His mouth.” (53:5, 7, 9, NASB). Yet through all of his suffering, God was pleased. He wasn’t pleased that the servant had to suffer. God was pleased because of the end result. “As a result of the anguish of His soul, He will see it and be satisfied; By His knowledge the Righteous One, My Servant, will justify the many, As He will bear their iniquities.” (53:11, NASB). Where does this leave us today? I find myself thinking about Jesus’ crucifixion. I am so thankful for what God has done for me. I know that I am a sinful person. Even after coming to Jesus, there are still sins that I fight with everyday! If it weren’t for the suffering of Jesus, I would have no hope of salvation today. I know that when it comes time for me to be judged, my sins have been paid for by Jesus’ blood. My only hope is that I live a life where I know Jesus, and he knows me. Jesus told his disciples, “Many will say to Me on that day ‘Lord, Lord, did we not prophesy in Your name, and in Your name cast out demons, and in Your name perform many miracles?’ And they I will declare to them ‘I never knew you; depart from Me, you who practice lawlessness. '” (Matthew 7:22-23, NASB). We can all be sure that we live lives that line up with God. The process is simple, but it is a difficult life. We must spend time in prayer, reading Scripture, and discerning what God’s will is for our lives. It’s hard, and there are many who say they do these things, but few who do. I pray that we can all be better at coming to Christ. Not just when we need him, but for every single day. Leaning on him in distress, thanking him for blessings. We need him for everything! **Personal note** Sorry for my lack of posting. Life got super hectic for awhile (ie. moving, business, still trying to figure out having a new baby, etc.). However, recently my problem has become that my usual time for blogging has gotten super busy now that I am working on a job change. Anyways, I am going to be trying out some new times for blogging. I will get this blog back on track and finish us the Book of Isaiah so we can talk about something new! Thank you for all your understanding. Isaiah opens this section by addressing all of God’s people (Northern and Southern kingdoms), in order to give them comfort during a long hardship (probably the Exile). The call is for people to return to God because He remembers them and is there to take care of them. Before we get to that point, God reminds them that even though people change, He doesn’t. “Shout that people are like the grass. Their beauty fades as quickly as the flowers in a field. The grass withers and the flowers fade beneath the breath of the Lord. And so it is with people. The grass withers and the flowers fade, but the word of our God stands forever.” (40:6-8, NLT). He knows that they have had problems, and He knows that more are to come. Yet He reminds them to stay faithful because He does not change. Isaiah then switches gears somewhat to tell us about the greatness of God. God says “To whom will you compare me? Who is my equal?” (40:25, NLT). Through the preceding verse we know that none can compare to our God. Isaiah mentions that God has held the oceans in His hand, measure the entire heavens with His finger, knows the weight of the world and all its mountains and hills. None can advise God, and He doesn’t need advise. Isaiah even states, “He picks up the whole earth as though it were a grain of sand” (40:15, NLT). But then Isaiah brings it all back around for the ultimate comfort. “The Lord is the everlasting God, the Creator of all the earth. He never grows weak or weary. No one can measure the depth of his understanding. He give power to the weak and straight to the powerless … But those shoe trust int the Lord will find new strength. They will soar high on wings like eagles. They will run and not grow weary. They will walk and not faint.” (40:28-29, 31, NLT). The Lord then turns to the idols of the nations and asks them to make a case for themselves. The nations become prideful when they are successful in conquering, or outlasting other nations, yet none of them realize where that power comes from. They attribute it to their made up gods and say that they are greater than the God of Israel. God tells His people, “Don’t be afraid, for I am with you. Don’t be discourage, for I am your God. I will strengthen you and help you. I will hold you up with my victorious right hand.” (41:10, NLT). He provides for them a miracle to prove to the other nations that He is God. “I will open up rivers for them on the high plateaus. I will give them fountains of water in the valleys. I will fill the desert with pools of water. Rivers fed by springs will flow across the parched ground.” (41:18, NLT). God shows the other nations that He provides for His people. He asks the idols to perform something, do a good deed, tell of the past, or tell of the future, and none of them respond. None of the idols can stand in comparison to the God of the Isrealites. He says to them, “See, they are all foolish, worthless things. All your idols are as empty as the wind.” (41:29, NLT). God sets His sights again on the future. He begins to talk about a servant that He has chosen to serve Him. God says, “I, the Lord, have called you to demonstrate my righteousness. I will take you by the hand and guard you, and I will give you to my people, Israel, as a symbol of my covenant with them. And you will be a light to guide the nations. You will open the eyes of the blind. You will free the captives from prison, releasing those who sit in dark dungeons.” (42:6-7, NLT). “I will lead blind Israel down a new path, guiding them along an unfamiliar way.” (42:16, NLT). God is seeking to correct His people. He goes on to discuss how they have become blind to His ways and are no longer keeping them. This is the reason for His servant to come. He will send His servant to correct Israel’s mistakes and bring them down a new path that will be unfamiliar to them, but is they one they should have been on all along. God moves beyond a servant, and begins promising a savior. “When you go through deep waters, I will be with you. When you go through rivers of difficulty, you will not drown. When you walk through the fire of oppression, you will not be burned up: the flames will not consume you.” (43:2, NLT). He speaks of bringing the people back to Israel, and tells them that they are to be His witnesses before all other nations. They are to proclaim, “There is no other God — there never has been, and there never will be.” (43;10, NLT). He promises to bring them victory over their sins. He goes on to talk about how they stopped presenting Him with offerings, but instead burdened Him with their sin. So He says to them, “I — yes, I alone — will blot out your sins for my own sake and will never think of them again.” (43:25, NLT). God then returns to the topic of the foolishness of idol worship. speaking to the people about how useless it is. “The person who made the idol never stops to reflect, ‘Why, it’s just a block of wood! I bunted half of it for heat and used it to bake my bread and roast my meat. Ho can the rest of it be a god? Should I bow down to worship a piece of wood? '” (44:19, NLT). The answer is, of course, NO! God says to His people, “I have swept away your sins like a cloud. I have scattered you offenses like the morning mist. Oh, return to me, for I have paid the price to set you free.” (44:22, NLT). There is certainly a lot in these chapters of Isaiah. I feel as though each one deserves a post on their own. But there is a central theme here, God is always there for us. God was looking into the future and knew what was soon to happen to His people. They were going to continue to rebel, and not listen to the Prophets. This behavior ultimately lead them to be exiled into the land of Babylon. Yet, He wanted to give His people every opportunity to turn around and come back to Him. He promises them a Savior to come and pay the price of their sin. We live in a world where that price has been paid. When Jesus was hung on the cross, it was not simply for all the sins of the world that had happened up to that point. It wasn’t for all the sins of the people alive and around at that point. It was for every single person who ever lived, and will ever live. I love that tradition shows us that Christ was crucified on top of a hill. Not just any hill, but a hill that overlooks Jerusalem, and Israel for that matter. I love the imagery, because it says to me that Jesus had the perfect view to see through time and see me. He could see me and he knew that he was paying the price of my sins. The same can be said of you. Christ saw you and knew that he was paying the price for you to be free. Paul writes, “and through him God reconciled everything to himself. He made peace with everything in heaven and on earth by means of Christ’s blood on the cross. This includes you who were once far away from God. You were his enemies, separated from him by your evil thoughts and actions. Yet now he has reconciled you to himself through the death of Christ in his physical body. As a result, he has brought you into his own presence, and you are holy and blameless as you stand before him without a single fault. But you must continue to believe this truth and stand firmly in it. Don’t drift away from the assurance you received when you heard the Good News.” (Colossians 1:20-23, NLT). Christ saw you on that day and is calling out to you. Will you respond to him, and say “Forgive me of my sins, Lord”, or are you able to come up with something on your own to justify yourself to God? I promise you nothing will succeed.